First of all, does the project Rogue Element still exist, or is this book closed? Indeed, Rogue Element as a band still exists although its been quietly laying dormant for the past couple of years, mainly due to the fact that Jerome has a very demanding position in the music industry which takes up a great deal of his time. Jerome’s equipment is still sitting in our recording studio in Bedford, waiting for his next visit, which I’m pleased to say, will be very soon. He is really looking forward to recording some new material for a possible new release. I have recently been looking at some old Rogue Element material. In fact, I found several DAT’s of music, which could be further investigated as well as the very limited edition release called “Storm Passages”, which was in fact our first musical outing. With further discussion with Jerome then maybe some of these old recordings may see the light of day. For your album “Flux Echoes”, you worked with other musicians. How did that come along, who are these musicians? I had pre-planned certain tracks that would incorporate the talents and input of other musicians. 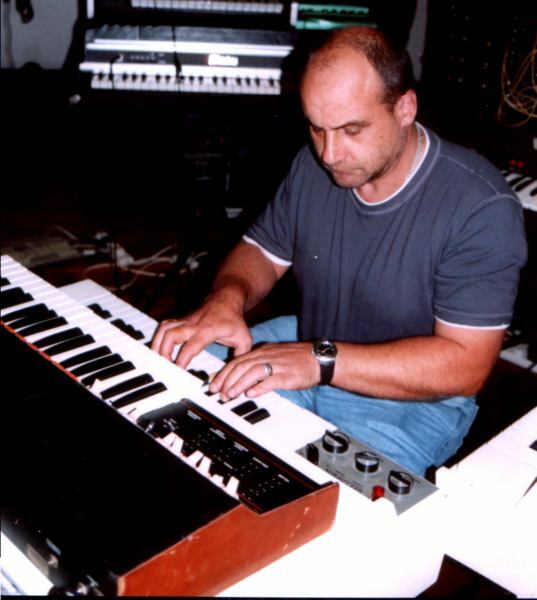 Of course I always have the input from my synth technician Adrian Dolente who happily plays mellotron or other synths. During the recording process, it’s always good to get his input and he’ll suggest certain off the wall ideas, which he will gladly show or perform. He is an absolute master when it comes to playing his own design synths, especially his SRS Aurora mono-synth and he manages to get sounds out of other equipment that nobody else seems to achieve – it’s a real bonus having his workshop under the Rogue Element studio. The second musician is Mat Roberts, who has a studio literally 200 yards from ours. 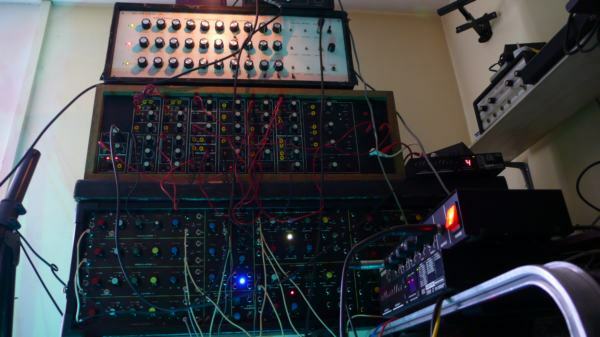 Again, he’s a massive vintage synth freak and his collection is even more extensive than ours. His two-floor flat is literally crammed with gear. He has always been a welcome friend in the studio and we both have great respect for each other. The ending of the third track “Phosphor Skyline” of the cd “Flux Echoes” was specifically composed with Mat in mind. A few days in his studio and we recorded the Hammond sections and piano ending on his beautiful ancient Steinway, aided by some wonderful vintage plate and spring reverbs. It was always my intention to have guitar on “Flux Echoes”, so my third musician, Shelley Walker, provided this with enormous skill. Shelley is a friend’s sister who was fascinated by my work and jumped at the chance. She is in fact a guitar teacher and plays in two bands and has enormous experience. She plays on three tracks on “Flux Echoes”: “Radiant Transmission”, “Phosphor Skyline” and “Torque”. She applied different techniques in each piece that just worked perfectly for me. In what way does the outcome and shape of your second album differ from your debut album “Expansion”? I think “Expansion” was a very successful musical outing, but I wanted “Flux Echoes” to be a more complex experiment with multi-layered sequencing and an improved listening experience. It was in fact a real nightmare because I suffered from a musical block for many months and the recording was a real technical horror. I went totally overboard on some production aspects, certain high-end sequencing thru different effects and vintage boxes, which really aren’t at all obvious to the listener, but they are there and were a real satisfaction when it all finally came together. Of course the mellotron again features very heavily in the music, utilising some new sounds and effects. 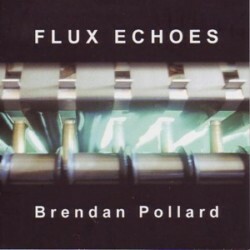 The ending of the opener “Flux Echoes” is a Tron-fest with mixed violin, cello and sound effects. I think the whole cd is a culmination of the learning experience any musician goes through during life. Some days I just didn’t even want to be in the studio, and I would sit at the Mellotron with absolutely nothing happening, other days were just a joy. So I think recording “Flux Echoes” over such a long period of time encapsulates those moods, which are perfectly reflected in the eventual musical output. Brendan, you have a strong passion for analogue instruments. How did that start, how difficult is it working with and relying on them, especially when you take them out on stage? What instruments are the most special to you? When Rogue Element first started it was a mixture of old and new technology. We both had an enormous passion for the old equipment, which has stayed with us but for me it has become even stronger. These days I have no digital keyboards at all. In fact, I just sold the last piece, a Roland JP 8000, so now everything I have is analogue. Over the past few months I have been expanding my side of the studio with purchases of two new modular systems, more old effects boxes and a couple of new special builds, one being the electro percussor which an analogue drum machine with built in phasers and five sequencer units to trigger other items on the other modulars. Of course it’s always difficult to use this old equipment. I have switched everything on in the studio and leave it for at least an hour, so everything is warmed up. Then I tune up and probably retune 5/6 times during the course of the day. Some days you just get lucky and retune maybe twice but they are rare. It’s a similar situation when taking the kit out for a live performance. For the E-Live performance, I was constantly on and off the stage making sure everything was in tune and running. 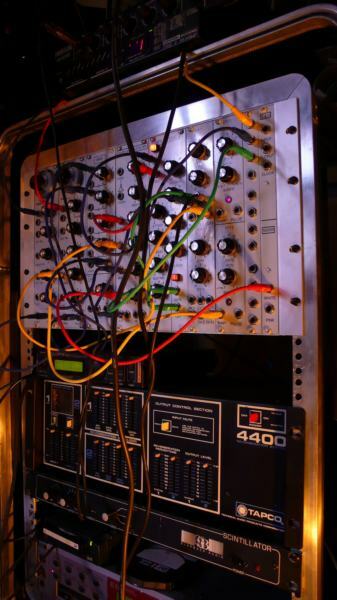 I’ve had the horrible experience of loads of kit failing on a live performance once before: one of the mellotrons blew some fuses, a ARP Pro DGX was all over the place, which is very unusual for those synths, and a Pro One failed completely. Recently, and my fingers are still crossed, I have been very lucky. The two new modular systems are slightly more reliable as far as tuning goes so these will not be too much of a problem for future performances. The two most special pieces for me are firstly the mellotron and secondly “The Beast” modular system, which just has such a glorious sound. I have never come across anything that gets near it, although it’s a pain in the arse to use. Recently she’s been recalibrated and redesigned, and I’m now able to use all four oscillators together, which was never possible before. How did you experience your concert at E-Live? In what way do you feel is the Dutch scene different from that in the UK or elsewhere? That really was a great show, my guitarist Steve Palmer, and I had a wonderful time. The audience was greatly appreciative, and I don’t think I’ve ever had so many people coming up to me afterwards saying how much they enjoyed the performance. It’s always a pleasure seeing many old friends at this fantastic event. Regarding the second part of your question: well, I think the Dutch fans are perhaps more willing to travel and support such events. Maybe here in the UK, we are slightly lazier and I can’t really comment on the USA, as I have never played live there. I have been invited several times, but the logistics of getting the kit over there are not worth contemplating to be honest. What is the electronic music scene in the UK like these days? How hard is it for your to keep up doing electronic music and releasing it on cd, while the consumer market is changing so fast by means of downloading etc.? I think the scene in the UK is still reasonably healthy. Of course generally, the EM- scene is nothing like it was compared to years ago when there were numerous festivals and concerts, which were all heavily supported. But there is a very talented bunch of musicians here in the UK, who is still all very enthusiastic and is willing to support and host various events, which to me is a very positive view. I have certainly seen a major change even within the past year of the download market, and it’s perhaps become a very important avenue to explore, although it’s an aspect that I haven’t looked at yet. Personally, I still prefer the old cd, but I can’t rule out for certain the downloadable approach. As long as sales cover the studio rent and rates, then I’m not too bothered about the financial aspect of the music. I’m in this because I enjoy it, and have a passion for the equipment and sounds. Of course the financial rewards are nice as they fund other new equipment as well, but if sales fell to nothing then so be it. My passion would still be there and I would continue. What is in the works at the moment? Anything else you’d like to share? There are numerous projects at the moment. First of all, there’s the already mentioned new Rogue Element recordings, and possible release of the older material. I’m currently working on a collaboration with Javi Canovas, and so far I have completed around 20 minutes of material. 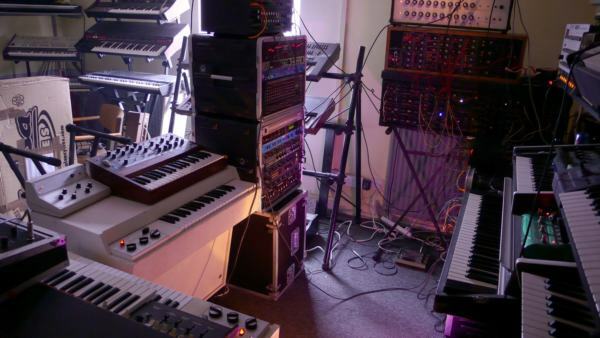 I then have plans to work with Free System Projekt on another collaboration, which will hopefully culminate in a visit from Marcel and Ruud to the studio, where more material will be recorded. I also have plans for a live studio concert to be professionally recorded via multiple cameras and I’m toying with the idea of putting together a band with guitarists, a drummer and keys along the lines of a prog experimental approach.